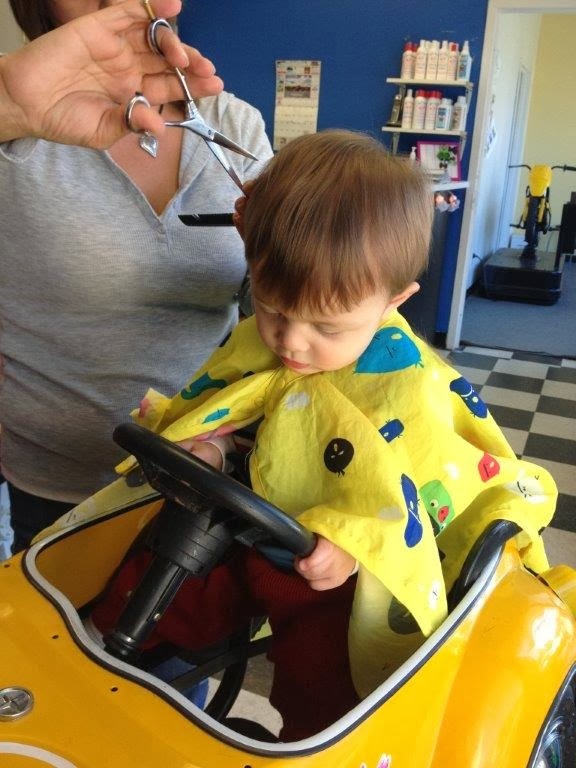 At 11-months-old, it was finally time to get the boys' hair trimmed since their bangs were about to hit their eyes. Is it even called bangs for guys though? Anyway, I got them all dressed up (since I knew I'd be taking photos) and went to a child haircare specialty salon called Snip Snaps in Stamford, CT, which has cute car shaped seats, TVs, music, etc. all to distract young children from the scissors. I had brought my iPad just in case I had to entertain them further, however, none of that was needed. They were perfect albeit wary at first. They definitely liked the cars and held on tight to the fake steering wheels as soon as they were buckled in. I also chose a morning appointment during the week so that it would be less crowded and we ended up being the only ones there. The salon gave me a little certificate to mark their first haricut and a baggy with a clipping of their hair. You might want to bring a tiny ziplock bag if you'd like a lock from their first hair cut too. Logan: Sweet, about time I get my own ride. just want to drive this car. Yup, all good over here! oh my goodness, how precious! My family liked to tell stories how I would not let anyone cut my hair, I'd scream my head off and fight like crazy. When they'd finally get me under control, they'd have to give me a really short cut b/c who would know how long it would be before they'd brave it again? I like the idea of the cars, nice way to have them think it is fun! Too cute! They are so well behaved! Thank you for sharing! Love this post!!! I have pics of my daughters first haircut, ata place very similar!!! Brought back awesome memories!!! Thanks so much for sharing! I wish they had a place like that around here! 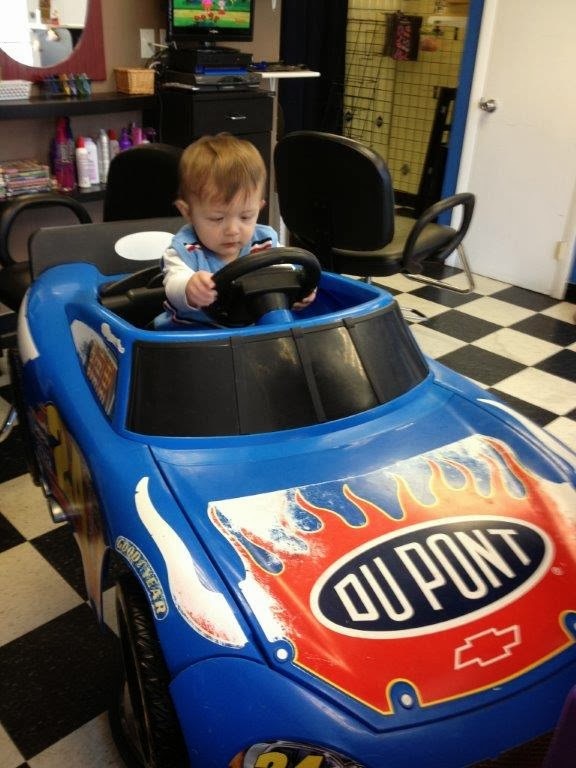 i think it would make the kids want to get a hair cut just so they could sit in the little cars. 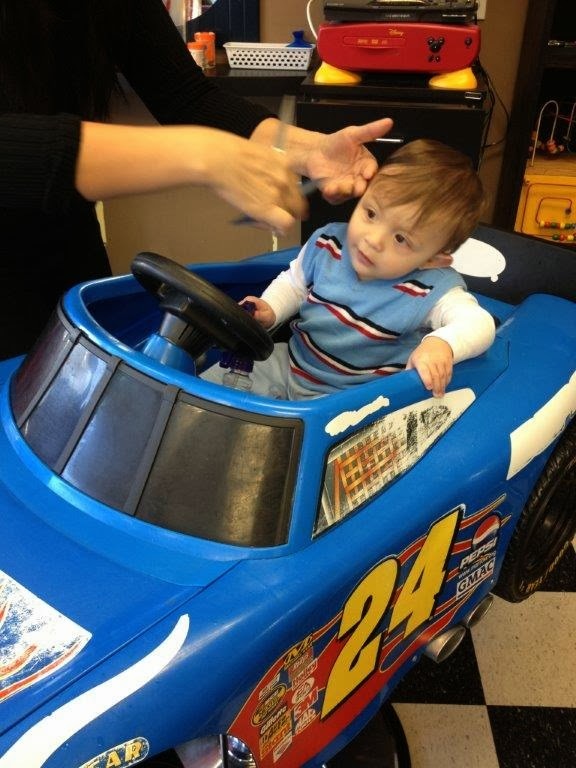 Oh I wish they had stuff like this in our area for kids cuts! 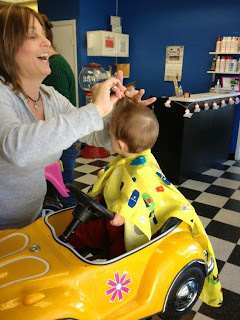 My daughter has sensory issues and she SCREAMS terribly when she gets her hair cut :( This would be great for her! Whoever thought of this is a genius! I've been putting the haircut off just because I don't think he will keep still and might get fussy. Too bad we don't have a place like this near us. I remember trying to give my boys haircuts when they were younger and it was horrible. You have to follow their heads around while trying to keep the cut straight. I think the cars are a great idea for those kids that are afraid of scizzors but in some cases this may make it a bit harder.